Incorporate a feminine touch to everyday looks with this chic top by Nicholas The Label. 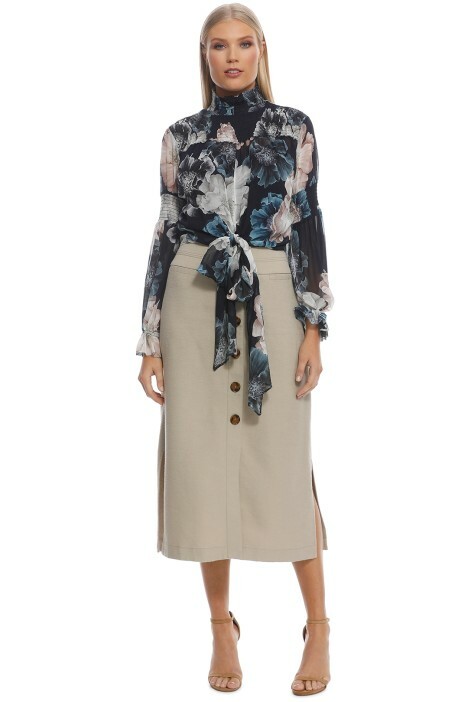 The floral print top is accented with smocked details on the high neck and shoulders, and a tie-front detail at the hem. Versatile and stylish, rent it for a work function or date night. Look amazing for your next date night by pairing the top with high-waisted jeans and ankle boots. Complete the outfit with flat chain drop earrings and a red foldover clutch available for hire. Check out our blog for makeup looks to try for date night! Pair this feminine blouse with an A-Line skirt or try Textured Button Up Skirt by Veronika Maine. LENGTH: This blouse is hip length. GREAT FOR: Petite, Straight and Hourglass body types.